In addition to providing a high quality and technology in drive solutions, Gates also provides you expertise on synchronous drive systems. 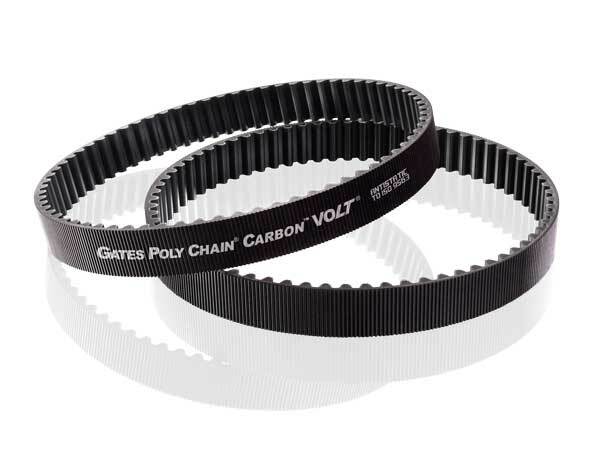 The Poly Chain® Carbon™ Volt® is the most powerful synchronous belt in the market. Poly Chain® Carbon™Volt® belt provides strength, durability, reliability and flexibility. Thanks to the carbon tensile cords reinforcement, the belt provides length stability with improved shock load and fatigue resistance, while reducing stretch and increasing flexibility. The new facing covering the teeth gives the necessary static-conductivity to the belt. The carbon fibre reinforcement brings a high potency and length constancy with improved shock load fatigue resistance and flexibility. The nylon fabric facing acts as a wear resistant surface and protecting teeth. It also keeps frictional losses to the minimum. Clean, quiet, compact, durable, maintenance-free, energy saving and eco-friendly operation. Created to work with standard Poly Chain® GT sprockets. 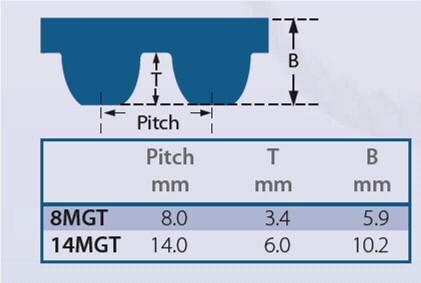 Suitable for temperatures from -54°C to +85°C. A different version can be used to 140°C. Can be used in: industrial equipment (mining, construction, food and beverage, wood, paper, pulp, textile), conveying equipment, lifting and handling equipment, agricultural and forestry equipment, machine tools, motorcycle rear wheel drives, bicycle drives … and many more.